We originally designed this page as a quick reference because well ... every Nevadan should make it a point to know their state's symbols! Our state flag might look a little bare compared to some other states, but it's greatly representative of our state's admittance into the Union! Our state flag is colored cobalt-blue to represent our most precious resource: water. A single five-pointed white star is located in the upper-left hand corner that symbolizes Nevada as the only state born during the Civil War. Encircling the star are two branches of our state flower (the Great Basin Sagebrush) while across the top spreads a golden scroll with the words "Battle Born," Nevada's official slogan. This design is a modified version of the original design that was approved on March 21, 1929. 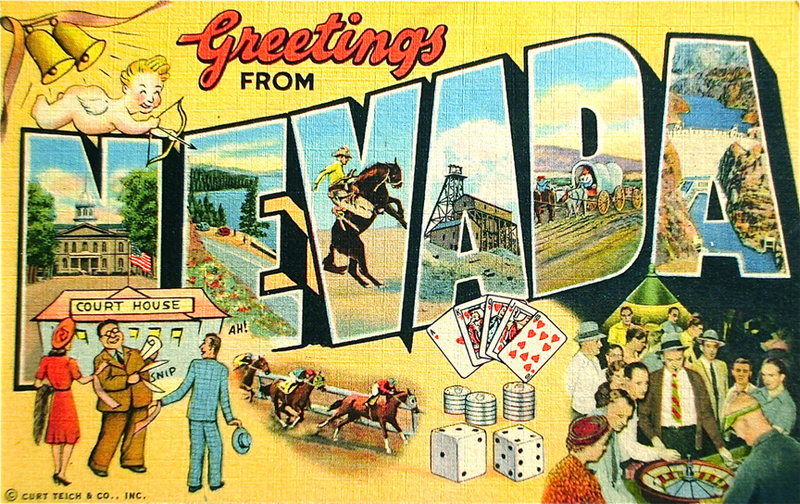 Nevada became a state in 1864 during the height of the Civil War. "All For Our Country" refers to its allegiance to the Union. Many believe its great silver wealth led the Union to victory against the Confederacy. "The Battle Born State" was a nickname thought to have been adopted in 1937. "The Silver State" was said to be a nickname given to us by a wealthy Virginia City mine owner while claiming his "victory" in Nevada. "The Sagebrush State" is self-explanatory and used by native Nevadans even today. 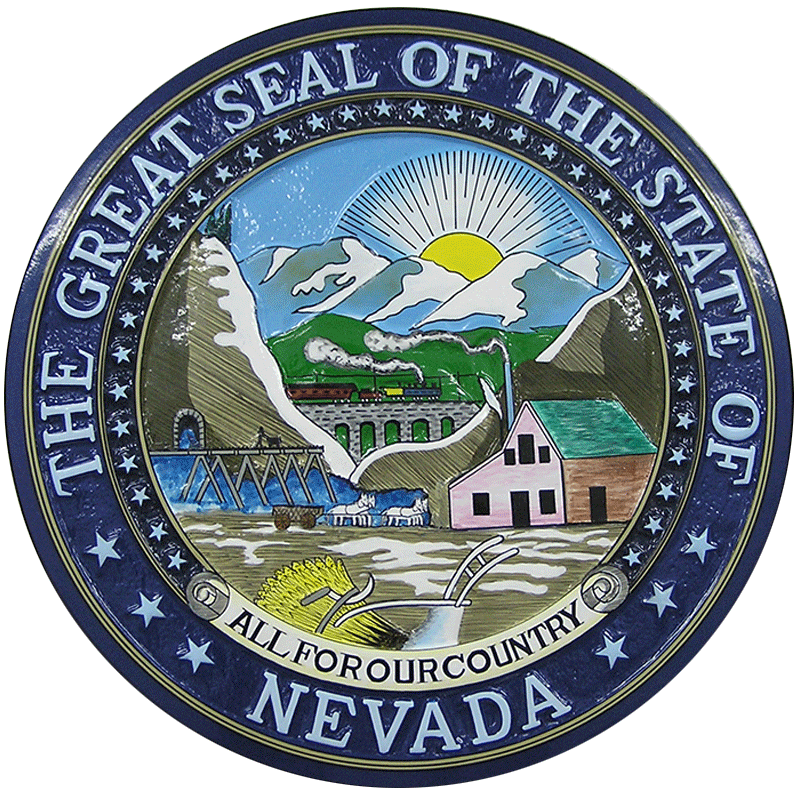 Nevada is represented by a number of things found on its state seal - most of which are mining symbols. One of these is a steam locomotive and a railroad trestle spanning a skyline of snow-capped peaks. Even the placement of the trestle (over a canyon) is historically accurate! Below this on the left is a series of mine shorings with a mule team crossing below it. Next to this (right) is the large assay office. The seal is rounded off by a total of 36 stars - representing our status as the 36th state admitted into the Union. The sagebrush might seem like a lazy choice when compared to the California Poppy or the Hawaiian Hibiscus, but what the sagebrush lacks in beauty it makes up for in resiliency. This hardy shrub accounts for about half of the state's vegetation and a hardened plant well-suited for survival. Kinda reflecting of Nevada, right? 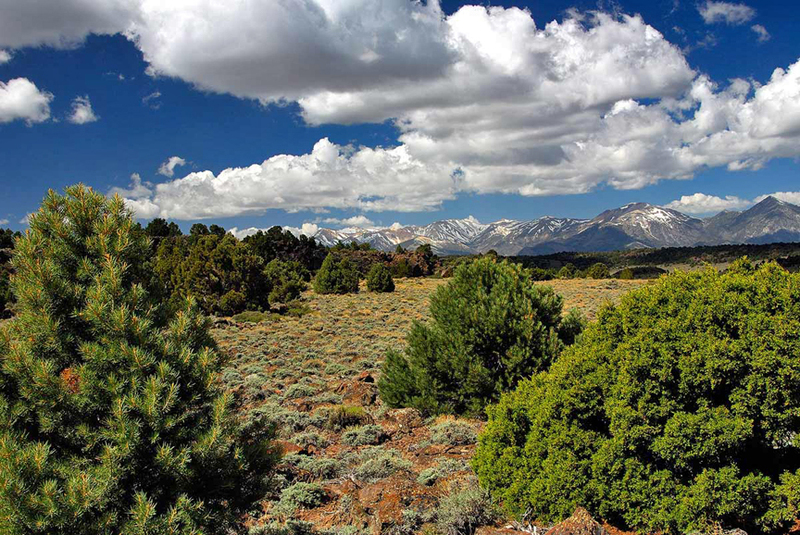 - The sagebrush is the primary vegetation across vast areas of the Great Basin and arid sections of the western U.S. and southwestern Canada - growing anywhere from 4,000 feet up to 10,000 feet in elevation. They most commonly grow at heights of three feet, but in relatively well-watered areas, sage can grow as tall as 12 feet. This remarkable plant is known for its strong fragrance especially when wet. As pleasing as it is to us, this odor is thought to be one of many survival tactics that discourages browsing animals such as cattle. On the downside, it's highly-impervious to fire and it actually relies on wind-blown seeds for re-growth. Any Nevadan who is an avid camper knows that stalks of sagebrush provide the perfect fuel for a campfire. Even a small stalk will create a fire that burns long and hot! In fact, native people relied on the sagebrush for thousands of years during the winter thanks to its reliable burn quality. It might not be the most beautiful plant out there, but it'll certainly outlive all the other 49 state flowers! This is a plant chosen as our state flower because of its extreme resiliency! Anything that can adapt to Nevada's many elevation zones makes it a great representative of our state. This year-round hardy survivor was adopted in 1977. 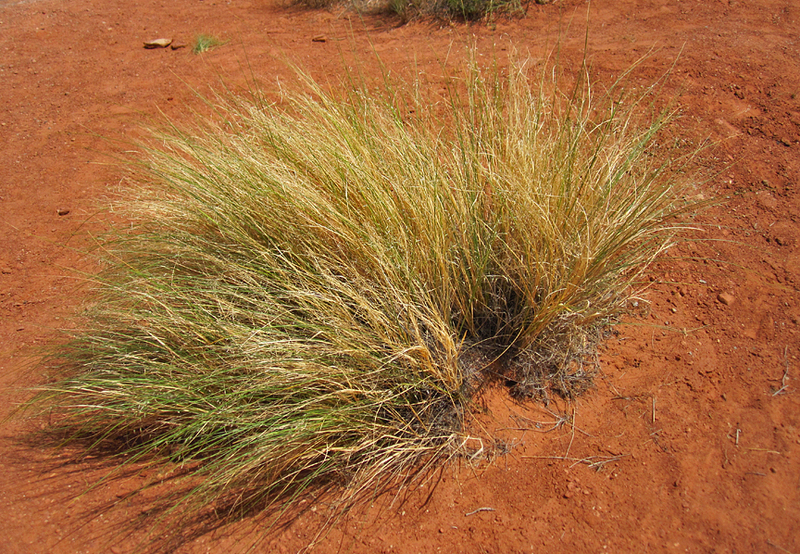 This plant grows best in sandy conditions and it does even better when it grows unmixed with other plant species. Rice grass is a true wonder q for wild grazers such as Desert Bighorn Sheep, Rocky Mountain Elk, Mule Deer, Pronghorn, and even jackrabbits. Ricegrass was a prime crop and staple food for many Great Basin Native Americans as well. Seeds were gathered and ground into meal or flour and made into bread, again, thanks to the grass's rapid growth and drought tolerance. "One sturdy Pinion Pine, or a family clustered together, are the only dependable woods in the Great Basin." The Pinion Pine covers 40% of the land found in the Great Basin from about 5,000 feet to about 8,000 feet in a zone biologists call the "PJ Woodland." These elven forests can be impenetrable, yet life-saving in the deep outback of Nevada. Not only do they provide dependable cover and habitat they also supply a very healthy source of food! The meaty pine nut can be harvested in the fall from mature pine cones and it's no wonder why the nut became a staple diet in the native people who have lived in the Basin. A single pinion pine can sprout hundreds to thousands of pine nuts about every 3 to 4 years depending on the age and location of the tree. Simply put, Nevada would not be Nevada without the Pinion Pine. Nevada is the only state with two designated state trees. On January 29, 1953, state assemblymen designated the Singleleaf Pinion Pine as our first state tree. In 1987, statesmen added the Bristlecone Pine! In comparison to the Pinion, the Bristlecone Pine survives worlds away in a completely different landscape. Bristlecones are the oldest living things on earth with an average lifespan from 1,500 to 2,500 years. Some specimens have even reached upwards of 4,900 years! Bristlecones thrive in the cold-arctic tundra above 11,000 feet in certain Great Basin ranges. This is a torturous landscape dominated by dry, icy winds. As amazing as this sounds, biologists have found that they grow best in the worst conditions possible. Some of the oldest trees have been found clinging to life on steep ridges and cold, rocky talus slopes where other forms of life have no chance. Like Nevada, bristlecones never say die and stubbornly hang onto life proving that beauty can be found in the unlikeliest of places. Both trees are nothing short of amazing and we think many would agree that no other two represent this state better! Nevada's state animal was adopted in 1973. The desert bighorn has become well adapted to the desert heat and cold. Unlike most mammals, their body temperature can safely fluctuate several degrees. During the heat of the day, bighorn often rest in the shade of trees and caves. Here in Nevada, seeing your state animal is truly a privilege and a stroke of luck. Bighorns are apt in avoiding humans and any form of human habitation (roads, trails, ranches etc.). People usually catch glimpse of them from a distance atop rocky ledges, or even in the backcountry at ground level. In 2004, Bighorn populations were at an all-time low brought on by disease with the introduction of domestic sheep, but Nevada's bighorns have been on the rebound since 2009. In 2014, there were an estimated 5,000 animals statewide and growing some 50-60 animals each year. This pretty bird was designated as the state bird on April 4th, 1967. 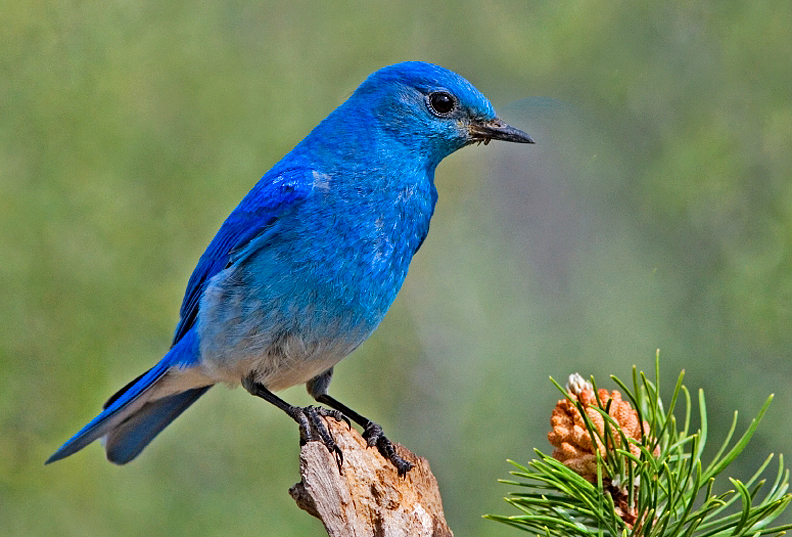 The Mountain Bluebird is a common sight in Nevada's ranchlands and rural settlements. The brilliant sky-blue color found in males is a pleasant sight in Nevada's gray-green landscape. With its home in the highlands of the Great Basin and with its gorgeous coloration, no other bird best represents the high-elevation Silver State. Adopted as Nevada's state reptile in 1989, the Desert Tortoise is a native wanderer of the Mojave and Sonoran deserts of North America, for us, making its home in southern Nevada. The tortoise was listed as an endangered species in 1980 due to pet collecting, habitat degradation, and human development around the Las Vegas and Los Angeles areas. Tortoise populations have been on the rebound since 2011! 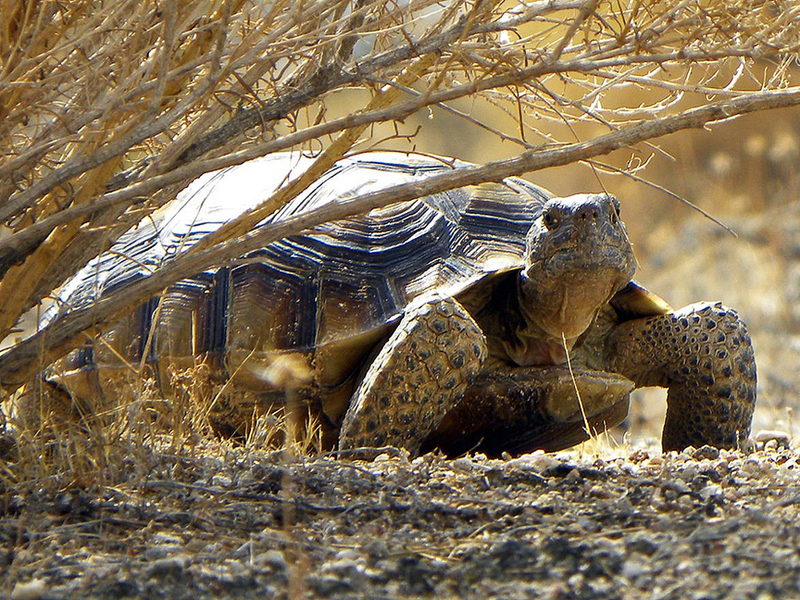 If they survive past 20 years, Desert Tortoises have a remarkable life expectancy of up to 50 to 80 years. Most attain lengths of 10-14 inches and some may grow up to 15 pounds when fully grown. These peaceful reptiles dine on vegetation and spend most of their time underground or underneath low overhangs, such as rocks and boulders. As remarkable as they are and as tempting as it might be, it is imperative that Desert Tortoises be left alone if we are to preserve them. If you see one crossing the road, you might pick it up and place it safely out of harm's way, then quickly leave it be. Tortoises stress very easily, one of the prominent reasons why they die in the hands of humans and in the loss of habitat. These lovely animals are much happier without human interference. 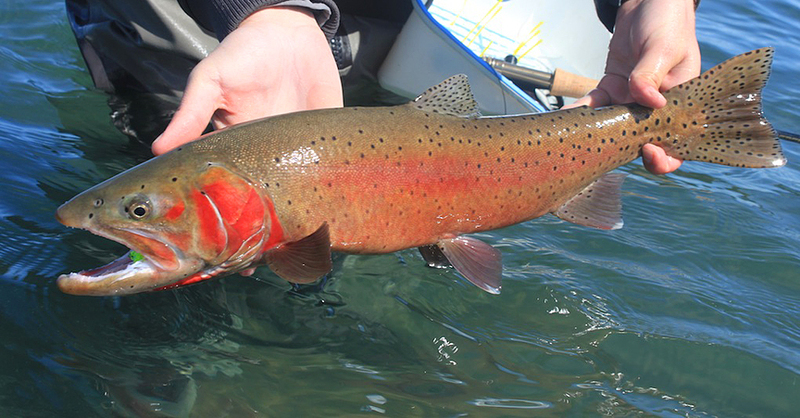 The Lahontan Cutthroat is a survivor - an ancient fish that has adapted to desert life over many generations. Such a beautiful fish is worthy of representing Nevada's enigmatic waters. During the Pleistocene epoch, the Great Basin was a land of many lakes notably a vast inland sea known as Lake Lahontan. The lake encompassed mostly western and central Nevada and stretched as far north as southern Oregon, and covered parts of eastern California. A change in climate occurred around 10,000 years ago causing Lahontan's waters to recede. As the lake shrank in size, the native fish along with the Cui-Ui (a type of sucker) escaped into the lake's nearby tributaries where over time the fish became isolated from other environs. In the ephemeral state of the Great Basin waters, the Lahontan Cutthroat has adapted to the region's alkaline waters, long cold winters, and hot dry summers. Today, Lahontans survive in the same drainages they retreated to so very long ago - now isolated perennial streams, hot springs, and select lakes throughout the Great Basin. Many generations have evolved the Cutts into a large and moderately long-lived predator. These trout can reach lengths of 3 feet in ideal conditions, although most are around 1 foot and smaller. Their size is completely dependant on the waters in which they're found. Lahontans primarily feed on Tui Chub, suckers, and other fish that are native to the region. The trout was able to remain a predator in the larger remnant lakes where prey fish continued to flourish, but upstream (creek) populations were forced to adapt to eating smaller fish, fish eggs, and insects. The record size cutthroat trout of any subspecies was caught in Pyramid Lake weighing 41 pounds. Fish and the desert are usually rare encounters. Lahontans make a nice exception to this rule. 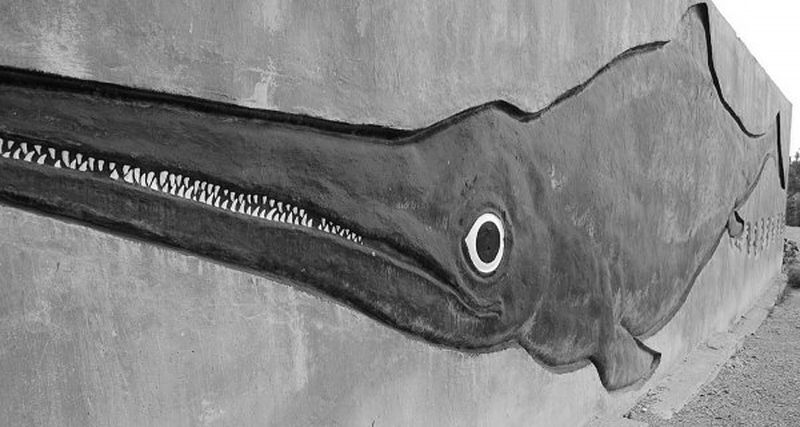 The Ichthyosaur was adopted as Nevada's state fossil in 1977. Ichthyosaurus Shonisaurus popularis is an ancient, extinct marine reptile that ruled the world's oceans during the Mesozoic era some 200 million years ago. "Ichthyosaur" means "fish lizard" and resembled a porpoise with shark-like dorsal and caudal fins, a short snout and paddle-like fins. Ichthyosaur remains have been found on every continent except Africa and paleontogolists estimate that their lengths reached 60 to 70 feet. Scientists conclude that these reptiles ruled the seas for about 135 million years. The ichthyosaur was declared Nevada's state fossil after a surprise excavation in 1928 in the Shoshone Mountain range of Nye County. The diggings revealed that forty of these reptiles became stranded in mud flats from a receding sea that once covered the state. The longest specimen ever revealed - some 55 feet long - proved to be the only complete skeleton of the species ever found in the United States. 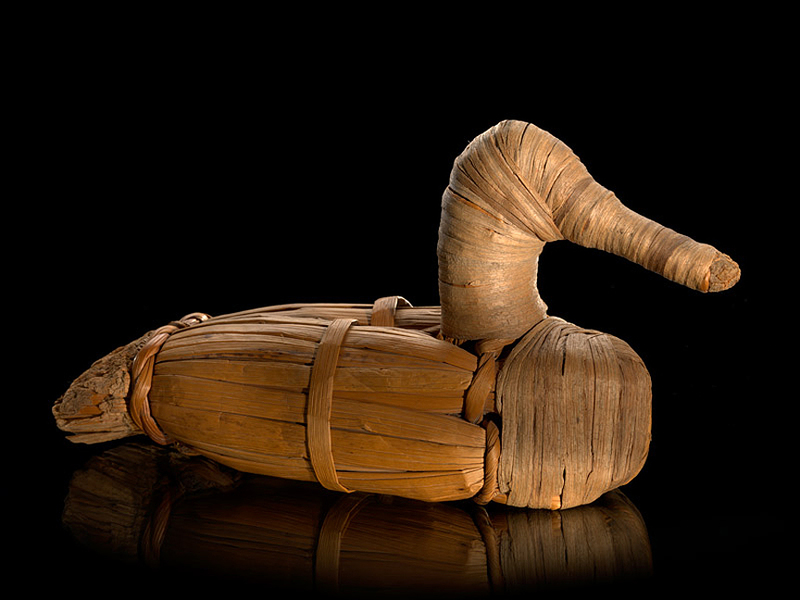 The tule duck decoy was proclaimed Nevada's state artifact in 1995. The duck decoys were discovered by archaologists in 1924 during an excavation to Lovelock Cave. These ancient devices were thought to be vital tools in the hunt and were cleverly made out of bundled bullrush (tules) so they could float. Remarkablely, a few of these decoys that were found in the cave are thought to have been created 2,000 years ago. The Nevada State Museum in Reno and Carson City and the Marzen Houses Museum in Lovelock have some excellent examples of these decoys on display. So what makes this one so special? The process in which this particular black fire opal was formed is a true rarity in nature ... so rare that it occurs in only a few places on the globe. One of these places happens to be right here in Nevada. 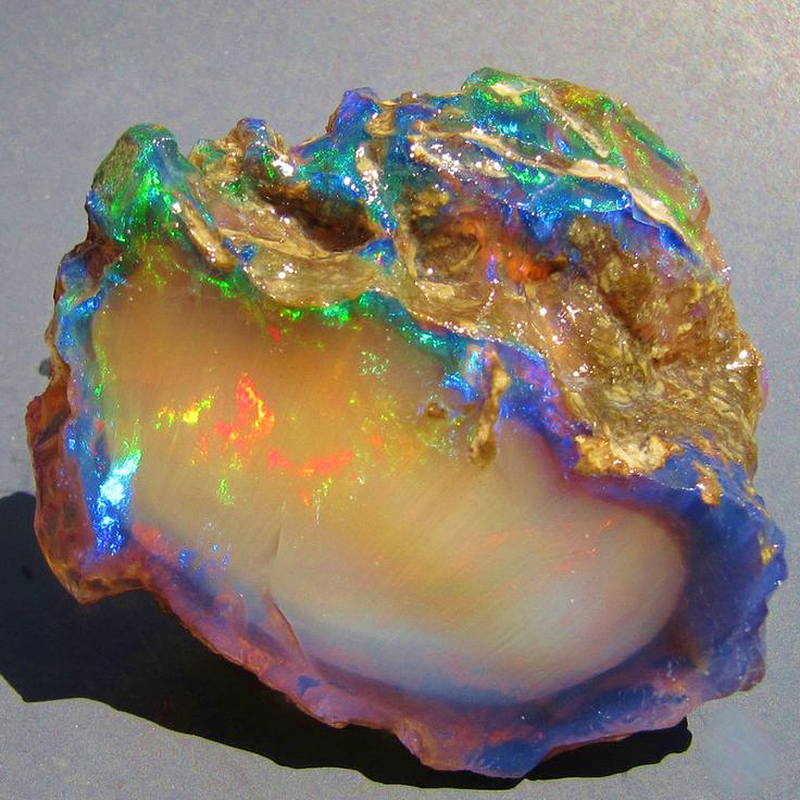 The rare black Opal found here occurs within a host rock of petrified wood known as "Gonk." One specimen of Virgin Valley Black Fire Opal was uncovered around 1980 and is so valuable that it's now encased behind one inch thick glass at the Smithsonian Museum. It's estimated retail price racked up a whopping $156,000 in 2011! Collectors from all over the world flock to the ugly clay hills of Virgin Valley in northern Humboldt County for a chance to unearth Nevada's state gemstone. Now that's something special. Nevada turquoise can be found in many parts of the state, but actually getting your hands on it will require opening your pocketbook. Currently, most of the turquoise in Nevada has originated from Lander and Nye Counties around Battle Mountain, Round Mountain, Big Smoky Valley, and Tonopah. Much of Nevada's turquoise lacks the smooth luster of Arizona turquoise, but its rough and veiny texture is a unique teal-blue to green color that has rivaled only by a few mines in New Mexico. Most of our turquoise has large inclusions which not only adds character, but produces an all-exclusive rarity. In fact, gemstone enthusiasts have created a separate category of turquoise just for Nevada - Lander Blue. It looks like we've adopted several state "rocks," but it's the only state with an official state metal. The discovery of Comstock silver contributed greatly to our admittance into the United States. Historians believe that most mining camps in Nevada were founded on silver rather than gold. It's kind of ironic that Nevada has switched gears as the third leading gold producer in the world. 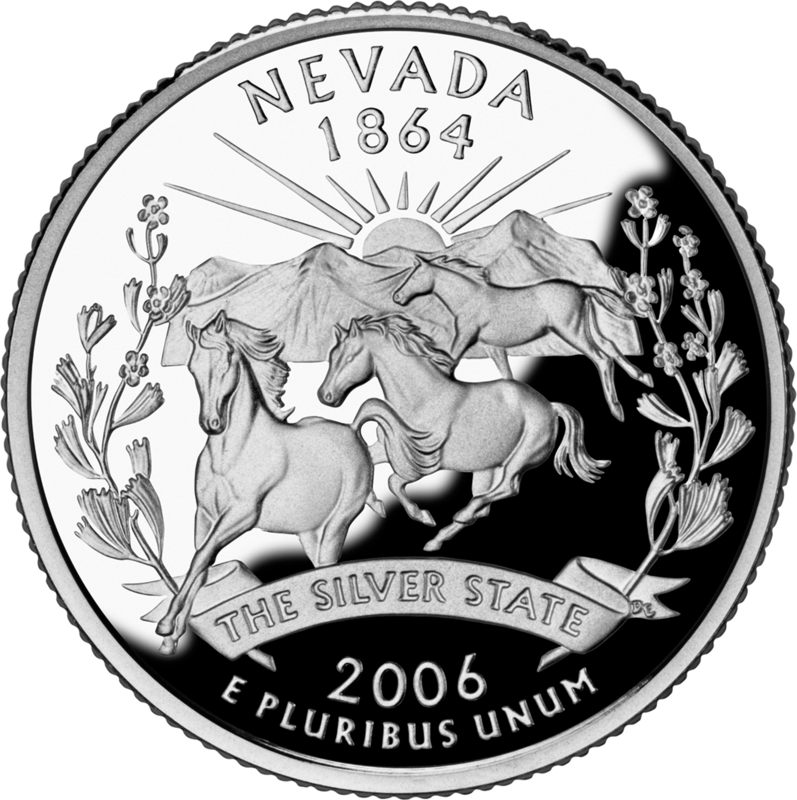 Nevada was the first state in 2006 to receive its state quarter and ours is one of the best in the series with an accurate depiction of a state mostly known for its gambling and tourism. - Across the center of the quarter, a band of wild horses parades across a valley shadowed by snow-capped mountains and a sunset. The horses are wreathed by a few stems of Nevada's state flower and a banner titling Nevada's nickname, "The Silver State." It's safe to say that many Nevadans were a little surprised and when no icons of mining or gambling took residence on the quarter. The mint had recognized Nevada for what it is: wild and beautiful. This characteristic "red" rock has been a driving force in creating many of the spectacular canyons and rock formations of the American Southwest. Sandstone is gouged and puttied by the forces of nature and the primary ingredient of these remarkable deserts. Although sandstone is found thoughout Nevada, albeit in less spectacular formation, southern Nevada, particularly Valley of Fire State Park and Red Rock Canyon, have been blessed with many of the same intricacies found elsewhere in the southwest -- arches, waves, hoodoos, caves, slot canyons and more. Sandstone has been a fine building material for people as well. Many structures in Nevada have been built with native sandstone, including the State Capitol Building, UNR's Morrill Hall, and the U.S. Mint Building, making it only fitting as a representative state rock. Nevada's state song was written by Mrs. Bertha Raffetto of Reno in 1932. The song impressed assemblymen so much that it was adopted on February 6, 1933. When asked what inspired her to choose the lyrics she did Bertha credited the Truckee River and a recent trip up to Virginia City as she looked out her window to the 100-mile view.